I only have 2 GB of cellular data available per month, and it goes by pretty quickly. While there are ways to manage it (not watching too many high-definition videos, not downloading huge files, etc. ), background activity can use up a substantial amount of data. 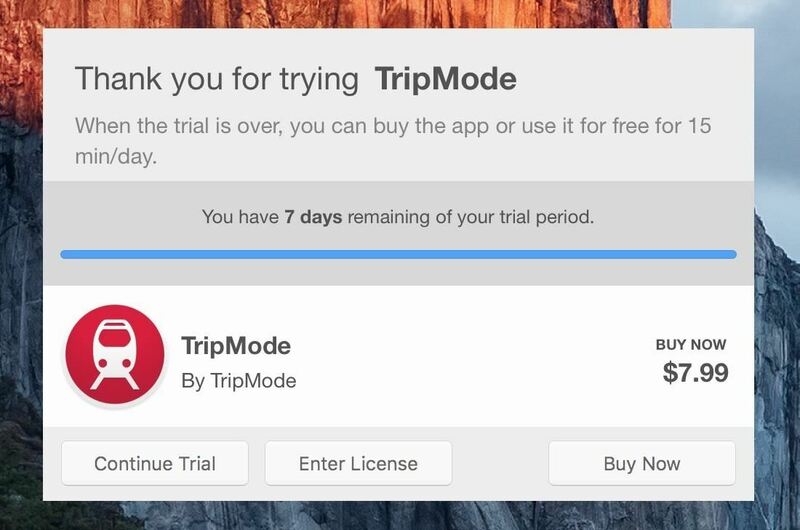 Designed by a team of three from Switzerland, TripMode gives you the power to pick and choose which applications on your Mac are allowed internet access and which are not, saving all of that precious portable hotspot data for the things that matter. You can download the free TripMode version from their website; after it's finished downloading, open the TripMode.pkg file to begin installation. Once installed, you can choose to either purchase the app for $7.99 or test out the fully-functional 7-day trial. If you don't want to spend any money, you can still continue using the free version after the trial ends, but you will be limited to using the app for 15 minutes a day. TripMode will exist in your menu bar as a black train icon; when you click on it, you'll see an option to toggle the service on/off, and it will show you the amount of data used, either for the last session, current session, or for the full month (you can use the drop-down to switch between these). When the service is activated, you'll see a list of apps that are attempting to access the internet on your Mac. Allow access by checking the box next to the app, or leave it unchecked to keep it from using any web data. It'll also show you the amount of data used for each app that's checked, so you can identify data hogs that you can either uncheck or use less. Note that all uploads and downloads will be disabled when TripMode is on, to further protect your cellular data cap. 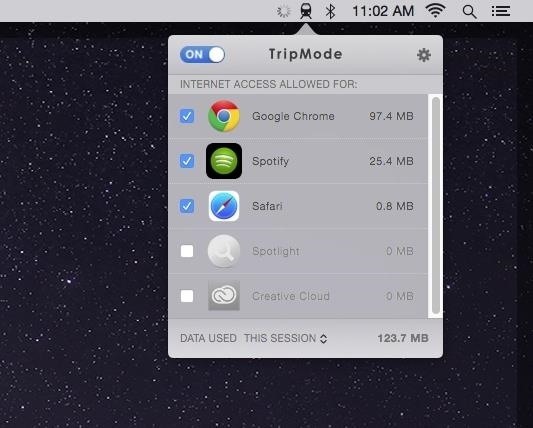 Overall, TripMode is a great app to use whenever you're connected to your smartphone's hotspot. It'll stop automatic updates, online backups, and photo syncing from occurring in the background—all of which can cost you data and would be better allocated to apps that you are actually using on your Mac.